Specialty frameless cabinets are a must for many homes – and if you want to make a cabinet with a door that's not at a right angle, then you'll need specialty hinges as well. Our angled hinges are ideal for pie-cut corner base cabinets, diagonal front corner cabinets and other non-traditional designs. WoodworkerExpress.com carries variable degree hinges made by industry leaders like Blum, Salice and Grass at angles as low as 15 degrees that allow professional cabinet makers to get creative with their work. The angles of these concealed hinges can also be increased in five-degree increments using wedge spacers and mounting plates, allowing you a door angle of up to a cool 45 degrees. Our variable cabinet hinges can be ordered for full overlay, partial overland, inset, corner merge and mitered corner cabinets with screw-on and tool-free installation options. 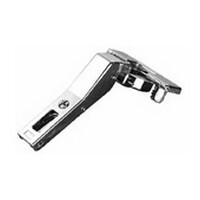 Some hinges can even be used for multiple applications with the right hardware – and we eliminate the guesswork by listing needed hardware in the related products section. 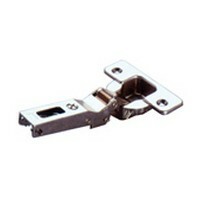 Use our filtering options, select hinges to compare or call us for expert advice. Every angled hinge that's in our 20,000-product warehouse ships same-day with a 100 percent satisfaction guarantee – and no hidden angles!